I’ve been playing around a little with Google Data Studio. 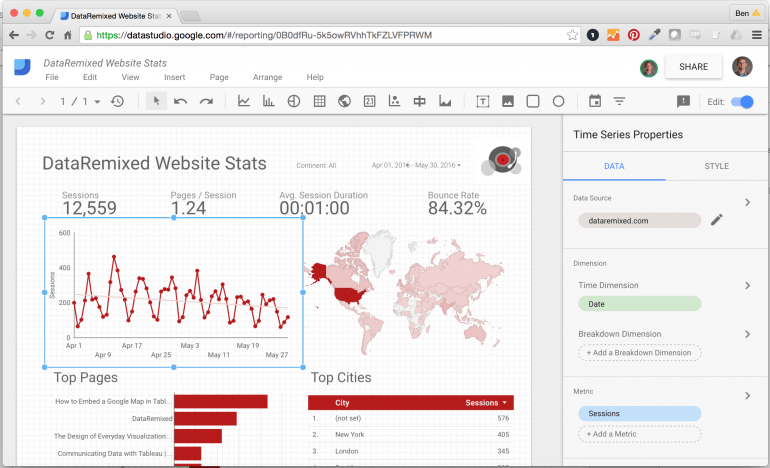 Google Data Studio is the free version of Google’s data visualization product Data Studio 360. It’s currently in beta as of the time of writing, and it lets you create up to 5 reports from connections to Google sources (like Google Analytics, Google Sheets, AdWords, YouTube). You can share these reports with others who can either view or edit them depending on how you configure them, just like how you’d do it with Google Docs. Now, I work for Tableau, but I’ve always written about different data viz tools on this site. I also teach data visualization theory at University of Washington. I teach students in my class how to use a growing number of free data visualization tools like Tableau Public, Plotly, Quadrigram and R. Lisa Charlotte Rost recently wrote a great blog post comparing 12 of these tools which I recommend you read. The number of tools is growing every year. I like different things about each of these tools. They all have their unique strengths, and their respective drawbacks. We live in a time in which data literacy is on the rise, but there are still so many people who don’t know how to effectively work with data that the true competition in this space is data illiteracy. But this is just my own personal blog, and my own musings on a topic we all love. Nothing more, nothing less. In playing around with Google Data Studio, I managed to create a visualization showing the health and wealth of countries using the Gapminder data set that Lisa had used for her tools review. After getting this first dashboard under my belt, I decided to connect to Google Analytics and tackle my website stats. The dashboard is embedded below, and you can compare it with a richly interactive version I created using Tableau Public a couple years ago here. Formatting the charts themselves was a little more tricky, but I got the hang of it before long. Click on a chart, edit the Data and Style options in the panel that opens on the right hand side of the screen, and you’re good to go. Adding filters, images and text was also very straightforward. The hardest part to figure out for me was how to change a “Scorecard” call-out at the top from a Sum to an Average. Eventually I got it – I just had to click on the data field I wanted to modify in the Data pane on the right and then click “Create New Dimension” and edit the metadata table. Allowing others to view and edit my work was also an intuitive experience, mostly because I’ve been using the exact same controls with Google Docs for a while now. So that’s efficient. Not much more to figure out there. Creating a simple multi-view dashboard was easy and fun, but I wanted to go a step further many times but couldn’t. For example, I’d like to add “rich interactivity” – letting my readers click on one chart (say a bar in a bar chart, a country shape on the map, or a data point on the timeline) and have that selection filter or highlight the other charts in the view. You can’t do that as far as I can tell. It could just be me though. I don’t claim to be an expert user of this software. Just a data viz guy who likes to tinker. So to me, Google Data Studio is a fabulous visualization tool, but not quite an analytics tool. Another limitation is that there’s no embed option, again, as far as I can tell. I can email and send links to people with ease, but I had to put a screenshot in this blog post because I couldn’t figure out how to embed it like a YouTube video directly inline. So it seems to me that it’s not really for sharing broadly on the web as much as it is for sharing amongst a group of colleagues. But for the latter, it’s quite effective. While customization of the views is pretty easy to do, it’s also somewhat limited. For example, I wanted to size the dots for each browser in the scatterplot at the bottom based on how much traffic came from each browser, but I couldn’t. So it’s a true scatterplot but not also a bubble chart. Color options are also fairly limited – you can’t use color density to encode quantitative data in bars in bar charts or dots in scatterplots like you can in choropleth maps, for example. And you can’t do other little things with color like change the color in an axis. The fact that there aren’t these features made it relatively simple to learn, but I often found myself unable to do what I wanted to do. This is an easy to learn data visualization product for your Google data sources that’s still fairly limited. Overall I really like the user interface, it’s very easy to connect to my Google data sources, and I really like the collaboration features. But while I could quickly visualize my data and add helpful filters, I couldn’t really drill down and explore the data in depth. It did pass one important test though – I learned as much about my data as I did about the tool while playing with it. Now to figure out what I can do to make this website more mobile friendly so I can increase the low percent of mobile readers….. Thanks for reading. Let me know if you’ve tried it out, and if so, what you think. Great and straightforward review. 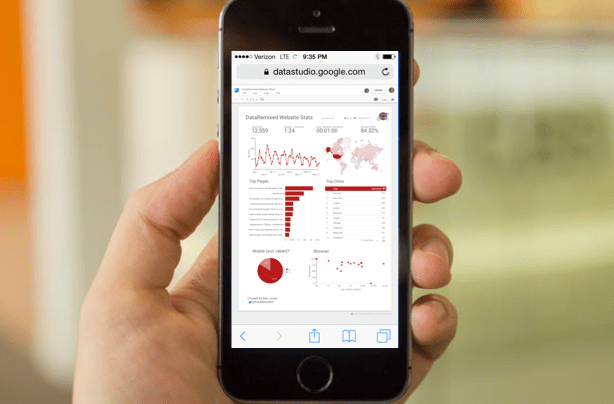 Google Data Studio and not at least the powerhouse of Google Cloud Platform https://console.cloud.google.com brings data analysis to the people big time. Google Analytics 360 https://www.google.com/analytics/360-suite is another marketing aspect. Nice review…I had similar reactions. My question for you is this: I have a colleague that saw a demo dashboard on data studio and asked if we could recreate it in Tableau…however I cannot seem to extract the data source from data studio (it’s the Internet Users and Population Dashboard). The “pills” on the data source look VERY familiar 😉 I just cannot get them out of GDS and into Tableau…any ideas? Also emailing you…hope to see you in Austin in a few weeks!